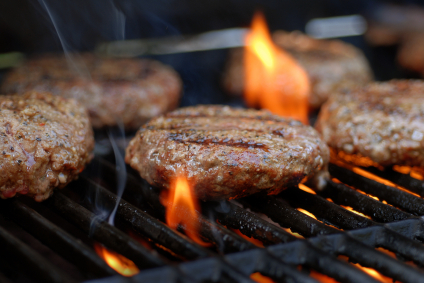 Just because you are grilling hamburgers this summer doesn’t mean that you have to sacrifice. I happen to think that cheeseburgers are one of the finest contributions to humanity made by we Americans. They are my often my final meal before leaving our shores and the first thing I seek out upon my return Stateside. But I’m no purist. To celebrate our friends’ return from Istanbul, we threw a dinner party featuring burgers, grilled corn, french fries and brownies a la mode. Salt and pepper the meat and shape into six patties. Handle as little as possible. Grill to desired doneness adding the cheese to melt at the last minute. Cook the bacon to crispness you like. Grill the bread. I brushed the bread with a little truffle oil, but I don’t think it’s necessary. Stack the cheeseburgers on the bottom half of the bun. Dab the mustard on the top half and spread with some of the paté. Top the burgers with the mushrooms and bacon. Too much of a good thing? Oh no. Not at all. Besides, while burgers are easy, they are rarely elegant. These may be as elegant as our humble sandwich allows. This entry was posted in Entertaining and tagged bison, Entertaining, recipes, summer. Bookmark the permalink. 17 Responses to Burgers Well Done. I can assure you that they ate nothing so good in Istanbul! Sounds wonderful! I can’t wait to try some bison burger. We like to stuff our basic hamburger or turkey burger with feta and serve with avocado and tomato. It’s so easy for hot and humid summer cooking. Too bad I can’t have that for my lunch today! Sounds divine. Oh I don’t know Mr. Redhouse…. check out my post on artichokes. The architect and friend travel very well, indeed. LucyinStLou, I do the same with ground lamb spiced with garlic and oregano. yum. Good heavens. Time for one of your burgers. The bison wins me over immediately. Fabulous recipe. Thank you Ms. Durbin. Reserve time for a siesta afterwards. Red wine helps the arteries too … . OK I am drooling. Not an attractive image, I know….but what did you expect with a recipe like this? I have been craving red meat ever since my children have declared that they are now vegetarians…what is with young people today?! I just think of Steve Martin, in the Pink Panther, “Hamburger,Hamburger, Hamburger! What I meant was that the Turkish equivalent of hamburgers (köfte) is nowhere as good as your bison burgers. Ask your friends. One can take just so much of ground mutton and cumin. katiedid, I feel your pain. Ah Mr. Redhouse, thanks for the clarification. Outside of the islands, I’ve given up finding my favourite taste treat. Although Mrs. E. and I did teach a French couple how to make burgers and martinis. After his first sip, the husband gasped and asked if we drank them all the time? I told him never before breakfast and that’s why we won the War. Mrs PvE, I have yet to see the new version — hard to top David Niven, Robert Wagner and Peter Sellers… not to mention Capucine. LBT, here it’s Five Guys Burgers and Fries. I delivered a bag to a sick friend yesterday and the temptation to take a bite on the way was dizzying. Didn’t even filch a fry. And today, a cheeseburger all I can think about. The recipe sounds delicious! You had me at the smoked gruyère. Oh my, how wonderful they sound. I am drooling!! I want to come to your home when I return home to the States this summer!!!! Hiya TIG, the smoked gruyère was definitely gilding on the lily.